The League of EVIL sent the master of the Arena one of their patented puzzle boxes. After making short work of the box, Octavian “Kripparrian” Morosan revealed Conjurer’s Calling. The card is a three mana cost Spell for the Mage class. 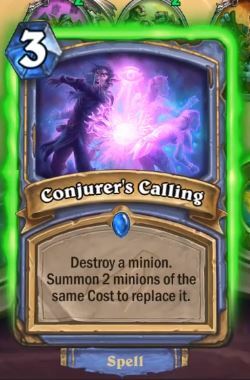 Conjurer’s Calling allows you to destroy a minion and then summon two minions of the same cost to replace it. This card definitely appears to have synergy with the newly-revealed Mage Legendary Khadgar. Since Khadgar forces your cards that summon minions to summon twice as many, you can bet Conjurer’s Calling will accompany him in a variety of different Mage decks. Kripp revealed the card on stream after a short struggle against the League of EVIL’s puzzle box. Unfortunately for the League of EVIL, Kripp’s superior game mechanics within the realm of puzzle solving were too much for their box to handle. You can check out Conjurer’s Calling and all the other Rise of Shadows cards when the expansion releases on April 9.